Bihar Vidhan Sabha Mains Admit Card 2019 Is Released..!! by the officials of the Bihar Vidhan Sabha on their official site. So, candidates who have applied for the 101 Advt. No. 01/2018 (Junior Clerk, Reporter, Personal Assistant, Stenographer, and Other posts) through the recruitment must and should refer to this page to get the updated information of the vidhansabha.bih.nic.in Mains Admit Card 2019. Furthermore, they have clearly mentioned the dates of the Bihar Vidhan Sabha Admit Card 2019, the Bihar Vidhan Sabha Mains Exam Date in the below links provided. So, gather the suitable steps to download the Bihar Vidhan Sabha Hall Ticket 2019, the Bihar Vidhan Sabha Selection Process 2019. Also, we have inserted the direct link to get your valid बिहार विधान सभा Hall Ticket 2019. Now, the link is activated. So, proceed and download it from the end of this page. Candidates who want to take part with the Bihar Vidhan Sabha must and should refer to these sections. Remember, those who have qualified in the first round will only be promoted to the next levels of the recruitment process. And below are the three rounds in the Bihar Vidhan Sabha Selection Process through which the candidates will be selected. So, after you download your Bihar Vidhan Sabha Admit Card 2019 for the Mains exam, you have to check the information present on it. If any of the information is printed wrong then you have to inform the officials of the Bihar Vidhan Sabha so that they will rectify or modify your mistakes. Candidates can download the Bihar Vidhan Sabha Admit Card 2019 online from the official site of the organization. Initially, candidates need to move to the official site of the Bihar Vidhan Sabha @ vidhansabha.bih.nic.in. Observe the direct link to download the Bihar Vidhan Sabha Hall Ticket 2019. Hit on the link and then enter the required details. Most probably, you have to enter the registered hall ticket number, date of birth, password. Furthermore, recheck all the details and then click on the submit button. Now, your Bihar Vidhan Sabha Mains Admit Card 2019 will be clearly displayed on the screen. Download and also take out the printed copy of it for further usage. 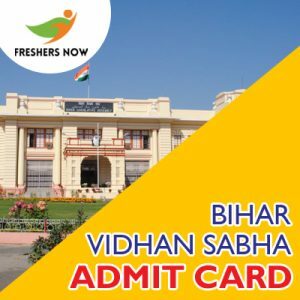 Follow us on FreshersNow page to get all the single notifications regarding the Bihar Vidhan Sabha Admit Card 2019. And also, bookmark us by Ctrl + D so that you will know all the latest information. Also, the direct link given above in this page will be activated only when the officials announce them out.